6 Cool & Unique Chess Sets That are Unlike Any You’ve Seen Before! Cool & Unique Chess Sets You Haven’t Seen Before! Take your game to a new level and impress your friends with one of these awesome chess sets. When buying a chess set, few people start off looking for one that is cool or even particularly unique. Most people are just trying to find a nice chess set that looks good and fits into their budget. Many shoppers don’t even stop to think about what style of chess set they would really prefer to have, they just think that a chess set is a chess set. They couldn’t be further from the truth! Yes, of course, there is one particular style of traditional chess set that automatically comes to mind. It’s black and white or maybe brown and white, with pieces that closely follow the Staunton pattern that we’ve all come to accept as standard. But that is not the only kind of chess set out there. 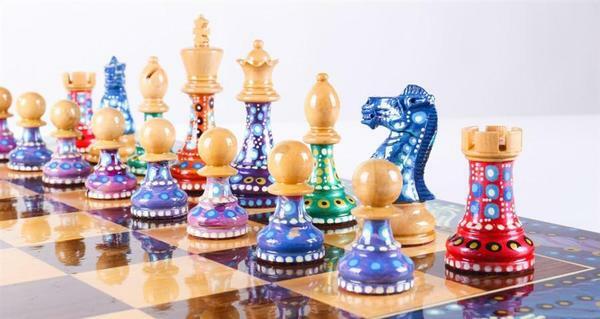 Your choices aren’t limited to the color of your pieces and the material that they’re made out of – there is a whole world of cool & unique chess sets for sale out there just waiting to be discovered! For example, did you know that you could get a unique chess set that featured scale replicas of real surfboards? Or an ornate chess set that perfectly represented the inside of a courtroom? You can! And, these are only a few examples of the incredible diversity to be found in the world of custom chess sets. You can find a cool themed chess set to fit just about any hobby, lifestyle, or design aesthetic if you just know where to look. This list will compile reviews of some of the highest quality unique chess sets that encompass a range of different styles and hobbies. There’s a little bit of everything, from modern, light up styles to Ancient Egyptian sets! 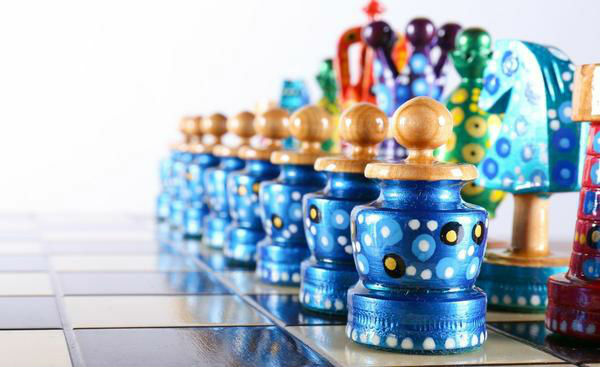 You’ll be surprised at the level of customization that is possible with a cool chess set. 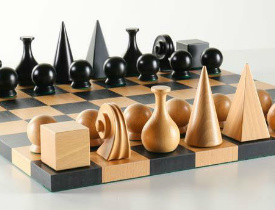 This cool chess set features pieces that are a unique design by the artist Man Ray. They are highly geometric in style, and though they are shorter than many other chessmen, the power of each piece on the board is uniquely represented through its relative volume. The pawns are the least powerful pieces on the board, so they are the shortest and also have the least volume in their design. The more important and powerful the piece is, the more space it will take up. Knowing this will help you easily distinguish between pieces, even though they look nothing like the traditional Staunton pattern pieces! 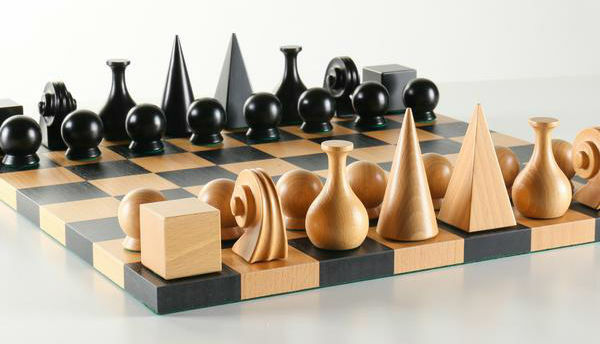 This cool chess set features pieces that are a unique design by the artist Man Ray. Another cool note about The Man Ray Chess Set design is that many of pieces have a hidden meaning behind them. For example, the King pieces are modelled after pyramids, an Ancient Egyptian symbol of royalty, and the Queens are based on traditional medieval headdress. The Knight pieces are so intricately carved that the work actually has to be done by an Italian violin maker who has the tools and expertise to produce the best scrolling for the piece. The rest of the set is made in Germany from fine Beech wood. The pieces are each finished off with a green billiard cloth base, which protects the Beech wood surface of the included chess board. The board is 17 inches square, ¾ of an inch thick, and features 2 ⅛ inch squares. The King pieces are 3.25 inches tall with a 1.5 inch base. Considering the astronomical price that the original Man Ray set fetched at auction, as well as the glowing customer reviews, we’d say that this unique chess set is a great deal! When it comes to unique chess sets, you really can’t get any better than this. Each set in this collection is hand painted by the artist and completely one of a kind. If you buy one of Sydney Gruber’s unique chess sets, you can be assured that no one else in the world will have the same one as yours. Most people you meet will probably have never even seen one like it! The Sydney Gruber’s Painted Chess Collection includes many cool chess sets of all different colors and styles, but if you see one that you like, you’ll need to act quickly to buy it before someone else does, since none of the designs are repeated. You’d hate to miss out on the perfect one of a kind chess set! This rare chess set collection is exclusively available at Chess House, through their collaboration with the artist Sydney Gruber. Sydney is a lifelong chess enthusiast and artist in residence at the Kentuck Art Center. 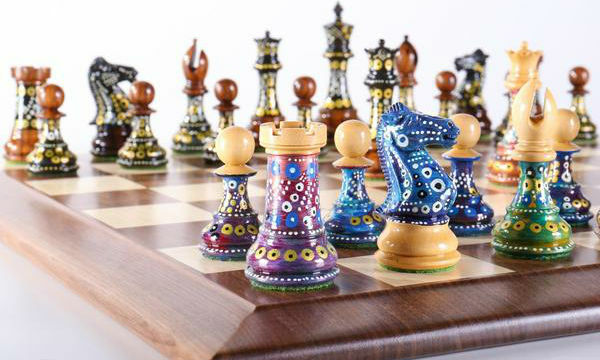 She creates her unique works of art on chess sets using a layering technique that puts colors on top of colors for a uniquely beautiful finished product. We recommend the full experience – the painted chessmen, board, and box. 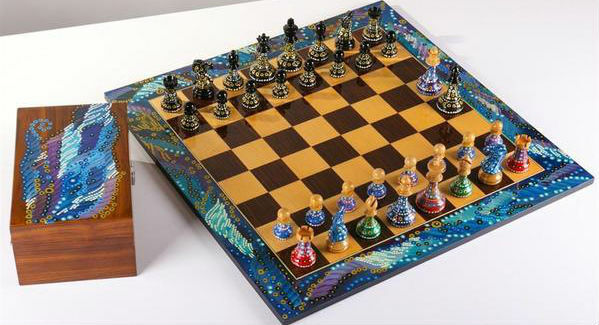 These awesome chess sets are available with only the painted pieces on a regular board, but we recommend springing for the full experience – the painted chessmen, board, and box. Since each set is produced by one artist working alone, sometimes the fully customized chess set goes out of stock, but you can always contact Chess House to see when it will be available again. Few of the Products are Still in Stock! 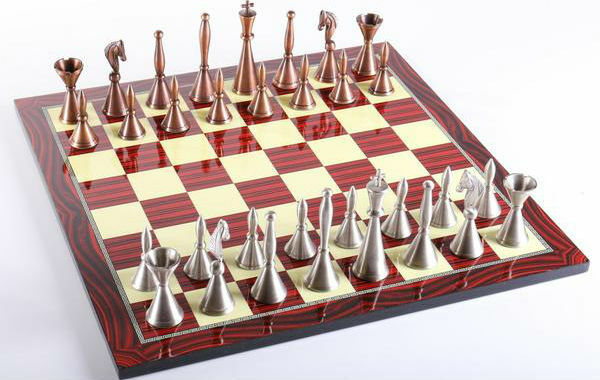 This cool chess set features a unique Art Deco design with modern looking metal pieces. The design of The Brass Art Deco Man Chess Set is sleek and smooth, with all of the pieces standing tall and slim like city skyscrapers. 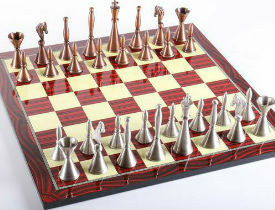 The bronze and pewter finishes of the unique pieces are set off by the red tones in the chess board. The unique chess board is made using a technique that involves cutting and pasting colored paper onto a wooden board and then covering it over with several layers of lacquer. The end result of this process is a custom chess board that has great visual depth without actually being inlaid into the board. This process also allows more freedom in choosing colors and designs, since they are easier to achieve this way than through traditional woodworking methods. The red color and striking grain of the dark squares is the perfect complement to the creamy whiteness of the light squares beside them. There is also an intricate Greek key patterned border. Even though the chess pieces in this cool chess set feature a unique style that’s not often seen, each piece is still easily identified. The Queen piece and the Bishop do share quite a similar design, but the difference in size is more than enough to distinguish between the two. The King pieces in this set stand 4 inches high, and the board is 18.25 inches square with 1 ⅞ inch squares. This beautiful chess set would make for the absolute perfect gift for someone who is graduating law school, passing the bar, or getting their first job as a lawyer. In fact, it started as a gift for the artist’s father, who was a lawyer and chess lover himself who was frequently inundated with the same tired gifts, such as “World’s Best Lawyer” mugs and things like that. The artist wanted to create a gift that lawyers would actually enjoy receiving, and thus, this custom chess set was born. As it turned out, The “Approach the Bench” Legal Chess Set filled a hole in the market that desperately needed to be filled, and soon, it was being featured in several different Law magazines! Now, this cool legal chess set can adorn the office of your loved ones, whether they’re in the legal field or not. 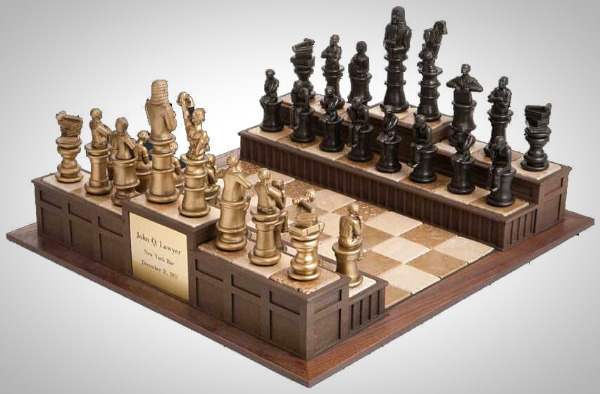 The unique chessmen are made of cold cast bronze in different finishes and are modelled after different courtroom fixtures such as the judge, lady liberty, the attorneys, the bailiffs, a stack of books with a gavel on top of them, and a pair of jurors. The King piece is a staggering 5 inches tall, so you know that this cool chess set is sure to impress. The chess board is also very unique. Rather than providing a completely flat and level playing surface, the starting positions of each side’s army are raised to imitate the furniture of a courtroom. The front line is elevated slightly above the rest of the playing surface, the back line is elevated slightly above that, and the King and Queen pieces are elevated even higher still. 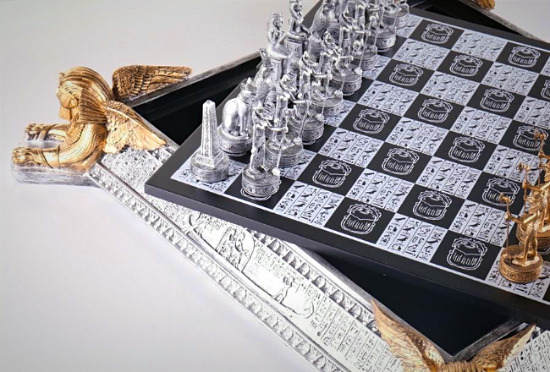 If you’re looking for an opulent, beautiful chess set that none of your friends will have, look no further than The Gold and Silver Egyptian Chess Set. 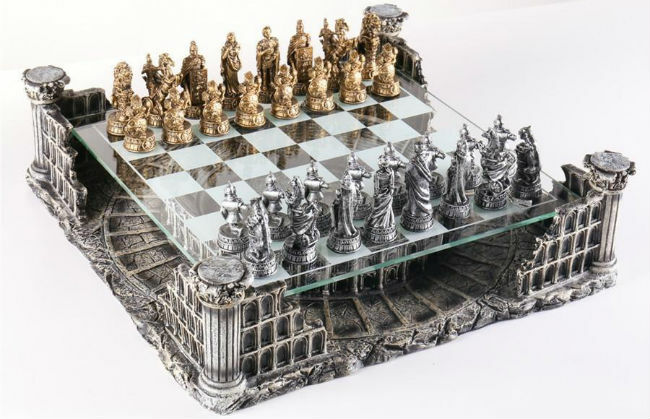 This awesome chess set is truly a work of art. The Egyptian chess set is a highly unique chess set that is made up of gold and silver likenesses of ancient Egyptian gods, goddesses, pharaohs, and other important figures. But it’s not only the figurines that impart the flavor of ancient Egypt on this decorative gold & silver chess set. The board itself is carved with hieroglyphics and adorned with a golden Sphinx on each of its four corners. Each of the squares on the playing surface is adorned with cool hieroglyphs and ancient Egyptian symbols. Playing on this awesome board is almost like being transported back in time to a far away place on the banks of the Nile river. It’s easy to imagine a set like this being used by King Tut, Cleopatra, and other famous ancient Egyptian rulers. Having an awesome chess set like The Egyptian Gold & Silver Set as part of your home or office is definitely a unique experience! Certainly not everyone can say that they have a unique chess set worthy of Kings, Queens, and Pharaohs back at home. The unique chessboard is 22 inches square, with a grid size of 1⅝ inches. It includes a storage area for the chessmen on the interior of the board. To access this storage area, you just need to lift the top playing surface out of the base. Inside is a felted storage area with plenty of space for even the large 3 inch tall King pieces. This unique chess set is just stunning, there’s no other way to say it! If you’re someone who pays attention to all the little details, this is the coolest chess set for you. Its design is so intricate and detailed that you can hardly take it all in at once. The Roman Gladiators 3D Chess Set is a very cool chess set that would be perfect for collectors, history buffs, children, or even just as a decorative, awesome chess set to have in your home. It’s certain to become a talking point with any guests who come over and see it. It’s hard to say which element of this unique chess set is really the star of the show. The chessboard is certainly a focal point, with its large, detailed Colosseum walls supporting a glass playing surface that seems to hover above the ruins. The full board is 16 x 16 x 4 ¾ inches, with a playing surface that’s 13 ⅝ inches square with 1 ½ inch squares. However, upon closer inspection, you’ll notice that each of the unique chess pieces is every bit as detailed as the 3D chess board. It’s hard to say which element of this unique chess set is really the star of the show. The pieces are made from die cast metal complete with a silvered or bronzed finish. The King pieces, or in this case Emperors, stand 3 inches tall and have a base that’s 1 ¼ inches in diameter. Each one is modelled after a person you might expect to find in the ancient Colosseum – gladiators, lions, spectators, Emperors, and their wives. With this set, you can play out a gladiatorial match with every chess game. Of course, you’ll have to provide your own sound effects for the clanking of swords and cheering or jeering of the crowd! 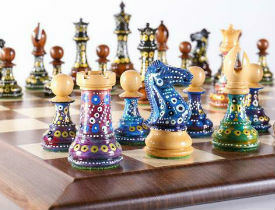 We hope that you have enjoyed our reviews of these highly unique and one of a kind chess sets. By now you’ll see that not every chess set needs to be stuffy and boring following the traditional style. We even know that cool chess sets don’t even need to necessarily be designed for the game of chess as we know it. With a little creativity and ingenuity, there’s practically nothing that can’t be turned into a cool and unique chess set. This list proves once and for all that there is no one “right” type of chess set that is better than all the rest. As with everything else in life, there are different strokes for different folks. If you’re not a fan of the plain black and white, Staunton pattern chess set, there’s no reason to buy one! You CAN have a good looking unique chess set that’s high quality and fits your design preferences. With so many unique chess sets for sale in 2019, there’s absolutely no reason to settle for the kind of chess set that you see everywhere if it doesn’t suit your personal style. Other people may be content to settle for a less amazing chess set, but now that you’ve seen the possibilities, chances are good that you’ll want to find the set that’s just right for you, rather than buying someone else’s idea of the perfect chess set. Buy a cool chess set that expresses your interests and personal style. In 2019, almost every home and office contains a chess set or two, but few of these sets do anything to stand out from the crowd. It’s a shame that they all look so much alike when there are so many different unique designs available out there now. When you own an unusual chess set, not only is it an excellent conversation starter, it also expresses a part of your personality. When someone sees your unique chess set they’ll know not only that you enjoy a game of chess, but also that you’re a free thinker and different from most other people. Depending on the theme of the chess set you choose, they might also be able to tell what hobbies you enjoy. Having a cool & unique chess set allows you to express yourself in an unexpected way. The chess set that you choose really does say a lot about you as a person. For people who want to express their unique personalities and interests in the way that they decorate their homes or offices and through the objects that they interact with daily, a custom chess set is really the only way to go. Trust us, it is worth it to dig a little deeper to find cool chess sets that is just right for you. Once you have found that one perfect chess set that really speaks to you, you will never want to go back to playing with anything else! The Best Chess Sets of 2019: Our Reviews List of The Best Chess Sets of 2019. The Best Antique Chess Sets: List of The Best Antique Chess Sets on the Market. Mammoth Ivory Chess Sets: List of The Best Ivory Chess Sets For Sale in 2019. Wooden Chess Set Reviews: Reviews List of The Best Wooden Chess Sets Online. Nice Chess Sets: The Coolest And Most Unique Chess Sets Online. Civil War Chess Set Reviews: Reviews List of The Best Civil War Chess Sets of 2019. Best Mario Chess Set: Review of The Best Super Mario Chess Set Online. Theme Chess Set: The Best and Most Sought-After Themed Chess Sets of 2019.